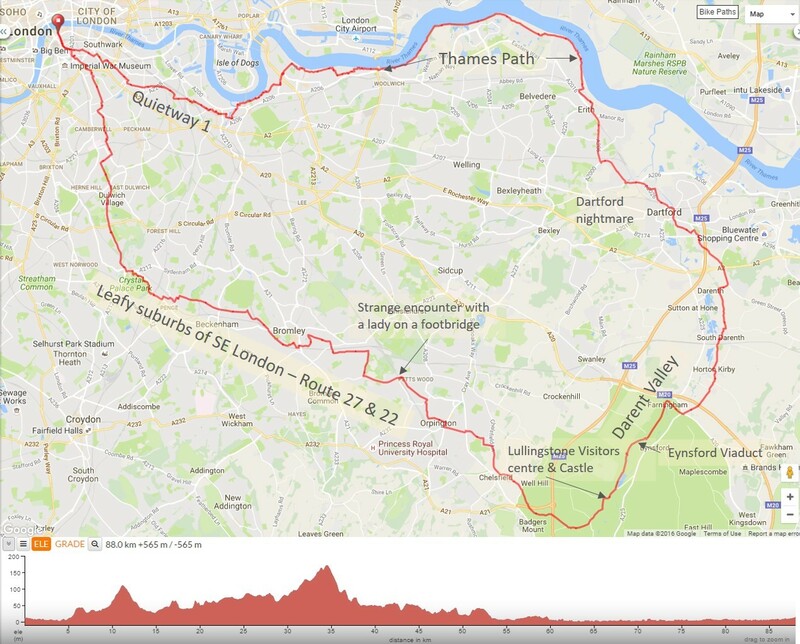 Inspired by my last Southeast London ride, which ended in Dartford, I decided to put together a ‘loop’ ride which incorporated the suburbs of Southeast London, followed by a trip down the Darent valley to Dartford, returning back along the already reccied Thames path. So here it is: London ride number 3. The Ride. I picked up the Sustrans route 27 at Crystal Palace, but before that, had to stop at Cadence bike shop to buy a peaked cap, as the sun was already so low in the sky that going east on a sunny morning was problematic (partly because the current trend is for ‘peakless’ helmets). I was worried that entering the shop may bring on the unstoppable urge for a coffee, but after only 4 miles, even I managed to control myself. The 27 route was patchily marked and if I hadn’t had my GPS I would have spent a lot of time re-tracing my steps, but as it was I made good progress, and the route was relatively fast (mainly quiet but straight back-roads, with very few shared pedestrian sections and traffic lights). I am always on a quest to find quiet routes out of London and routes 27/22 certainly get you there, but it is not the quickest route to the country lanes by virtue of London’s erratic outline. The suburbs extend much further in a southeasterly direction than they do if you go due south, so I didn’t hit the country lanes for a couple of hours. At Petts Wood I crossed the mainline railway via a pedestrian footbridge and as I approached it, I un-clipped one foot and started to scoot across, rather than be bothered to fully dis-mount. The bridge was comfortably wide enough for two people side by side, and I take up more space fully dis-mounted than if I remain on my bike. Can you tell where this is going? So, there is an elderly lady coming towards me and as I approach she mumbles something, with a slightly plumby accent. The conversation goes like this: me ‘pardon?’, her ‘can you read, or are you blind?’, me ‘yes I can read but I didn’t think that I was being dangerous’, her ‘no no, it was just a question, a lot of people around here are partially sighted you know’. I stood there for a moment trying to understand anything about the encounter, and as I set off, she called after me ‘I’d have given you a much harder time if you had been a young man, you know’!. There were so many layers of assumption and prejudice, I didn’t know where to start. I did get off and walk because even though ‘rules is for fools’, she had (in her mind) cut me some slack, so I reciprocated. Funny world! A couple of miles from Orpington, the suburbs suddenly stopped and I was climbing steadily on small country lanes, and then as suddenly as the city stopped the Darent valley opened up in front of me, signalling the end of the climb up the North downs. The lane eventually swung down the valley and I gained some reward for what had been a steady climb for most of the morning. I do like routes that get all the hard work out of the way early on! I stopped for a quick coffee at Lullingstone Park visitors centre, before continuing on a small stretch of gravel path which followed the Darent river to Lullingstone Castle. Lullingstone Castle dates from the 1400’s and has been owned by the same family throughout it’s history. Perhaps not surprisingly, Henry VIII stayed there, probably on his way to Dover and France. Possibly more eye-catching than the Tudor gate-house is the Victorian viaduct at Eynsford, but they all looked pretty good in the late autumn sun. My route continued on down the Darent valley through the picturesque villages of Farningham, Horton Kirby and South Darenth, and at some point along this extremely pleasant stretch, my GPS decided to malfunction. It wasn’t a fatal explosion or even a loss of data or screen information, it was just that the screen wouldn’t remain zoomed in for more than a couple of seconds. This meant that unless I stopped at every junction and fiddled about for 10 mins I was very likely to go off-course, and I was about to embark on the most complicated section of the ride; an attempt to get from South Darenth to the Thames Path via Dartford. As I entered the village of Darenth I felt like I’d been thrust into a world where every sense was assaulted by something deeply unpleasant. It was all noise, aggressive drivers, large trucks, narrow roads, massive roads, poor signage and before I knew it, I was lost in the outskirts of Dartford. Just to rub salt into my wounds, my GPS was so zoomed out that in made the Thames look like it was at the end of the street, but I knew it wasn’t. As I passed the railway station, I knew that an easy option would be to take the train back, but I did that last time. I also knew that if I could get to the Thames Path my blood pressure would fall, my lungs would expand and everything would be fine. Eventually, I had the Thames in my sights, and indeed everything was fine. I cycled back towards London, with glimpses of Canary Wharf and The City getting ever closer. Past all the various sewage treatment plans, the sands and gravel conveyors, Gallions Hill, Woolwich Arsenal, Woolwich Ferry, the Thames Barrier to Greenwich, where I ate a carton of Seafood, East London style (cockles, mussels, brown shrimp, prawns and whelks with a splash of vinegar and white pepper). I wasn’t treated to a Thames sunset as I had hoped, but as I turned into my road, I felt like I’d been away for days. Cycling back along the Thames path under leaden skies, past the modern sewage processing plant at Crossness. Verdict: At Dartford I was prepared to bin the whole idea of a loop ride, but having completed it, I realized it was an incredibly varied and interesting ride and just needs the bit around Dartford sorting out. This ride can be found on Ride with GPS here. The route around Dartford is revised and includes a section along the Darent Valley Way. Much more fun! By the way muscles are not mussels! Thanks! I need a proof reader!